As I finished packing up to go home today, I couldn’t help but realize how much swag I was given throughout the course of my time here in Chicago. 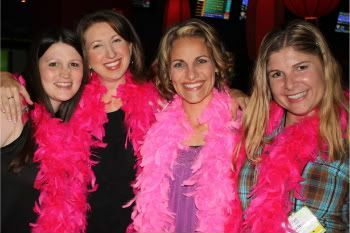 While all of it was amazing, not even the video camera that I received can truly compare to the memories I made when I saw a good friend in person for the first time, when I met up with tried and true blogger buddies, or when my favorite PR gal and I squealed when we saw each other. Oh, and the hugs are always one of the best parts for me… Hugs from old friends, new friends, and even some celebrities! Even though most of these moments weren’t captured on film, they are memories that will last forever. We have seventeen (yes, you read that right… 17!) children between the three of us! Two of the most amazing and down to earth artists out there, Brooke White and Chris Mann. L0oks like a good time. How awesome! 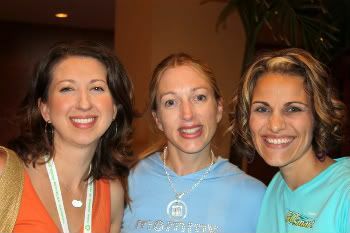 I sooo want to go to BlogHer some time. Love the pick of the three of us….man, we could have one rockin’ playdate with our 17 kids! You are quite photogenic! 🙂 You have a beautiful smile! I’m glad you had such a great time! I already miss your brightness. It’s contagious! Really! How cool that you got to meet Brooke White!! Those are some really great pictures! 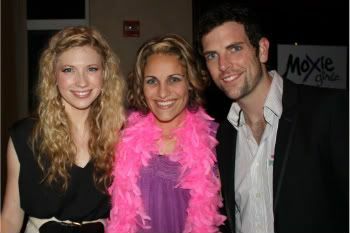 How awesome you got a picture with Chris Mann and Brooke White! 🙂 Thank you for being a shoulder I could lean on even when you felt like crud. You’re an amazing friend. It was so great to see you. Miss all of you already. Chris, your hair looks gorgeous! Love ya! 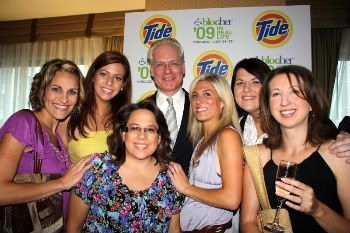 Oh my gosh, you met Tim Gunn? I’m so Jealous!